"You can do a lot in one single day; just imagine what can happen in three months"
This is an email advertisement for the online version of El Pais, Spain's main newspaper which belongs to the PRISA group, the pro-Socialist media organization that, together with its sister SER radio network, was behind the agit-prop campaign after the March 11 bombings. It's also the same newspaper whose main headline on September 12th 2001, all across its cover, was "The world, awaiting expectantly for Bush's reaction". Yes, it was, and is, that disgusting. Shame on them. "Honey, cancel our trip to Spain this winter." It's kinda sad to hear this, but I'm afraid I can't blame him. para mucho" has an unmentioned ellipse, as in "un día da para (hacer) mucho" (hacer=to do). UPDATE IV. More on the translation of the now infamous phrase "Un dia da para mucho". Quite a few people insist that the correct one should be "A lot can happen in a day" (as I wrote in the previous update immediately above, the original Spanish one is an idiom that cannot be translated literally). Most of the people objecting, though, know Spanish as a second language. Of course, you can argue that, after all, English is a second language for me (see this blog's motto in the heading), and that it may be me who's made a mistake and mishandled the English meaning of the sentence. Perhaps. However, people like John Chappell, an American expat who lives in Barcelona and whom I personally know and trust (and who is a professional translator) seems to agree with me; I haven't talked to him about this as he is on holiday in the US right now, but he wouldn't be linking with approval if my translation was botched. John Pawlenko and V-Man, Americans living in Spain, don't seem to impugn my translation, either; I bet they would if they found it was not correct. Neither does Fausta -who is bilingual- from New Jersey. At Tim Blair's, Juan also agrees; Marzo writes "By saying "un día da para mucho" you could conceivably be trying to say "a lot of things can happen in one day", but you wouldn't be saying it. The meaning conveyed is "much can be done in one day". (Done by whom? That's another question.) Although it is not at all impossible that the ad was just lousily written; it would indeed match the bad taste in the selection of the subject of the pictures." Meanwhile, Trevor's version (who is tri-lingual, or tetra-lingual, I've lost count) is "A day is enough for a lot", but I think it still lacks the active agent implied in the original Spanish phrase. I have to say that I'm not convinced that the translation should be different to mine; of course, I'm not claiming I'm infallible (though I come close! ), and perhaps I'll have to ask Dan Rather to refer me to some experts on this. In any case, even if I was wrong, the ad would be unacceptably tasteless. Allah and Rube demonstrate why, by simply turning the tables. UPDATE V. John Pawlenko writes to correct me. Not about the translation, but his nationality; I thought he was an American, but he's British. My bad, John, sorry. UPDATE VI. I have an important update in a separate post, in which I'll continue with any new development. 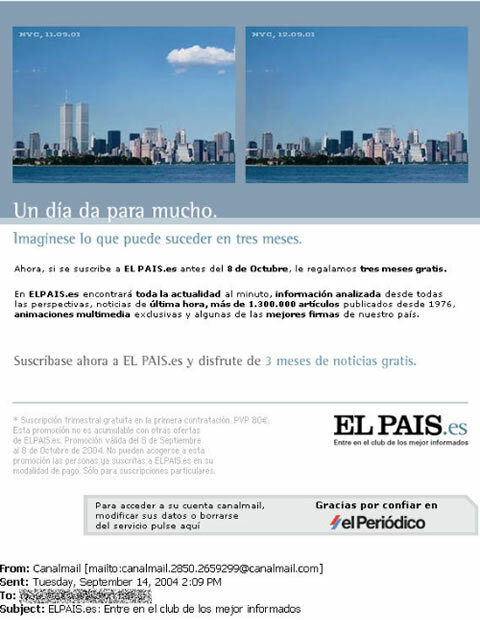 I'm addressing there the attempt by El Pais to present this advertisement as a hoax, which doesn't seem to be the case. Here's why.